A Batman party (with black and yellow colors), Spiderman party (with red, black and blue colors), Superman (with red, white and blue), etc. The ideas below mainly focus on Spiderman and Batman, although many can be easily tweaked to fit any Superhero theme. Villains are also an important part of these kid birthday parties, so, remember to invite Batman’s nemeses: Catwoman, Joker, Penguin, Two Face, Mr. Freeze and the Riddler; Superman nemesis Lex Luthor; Spiderman nemesis Green Goblin, etc. Insignia Invitation: Use cardstock to cut out the invitation in the form of the chosen Superhero’s special emblem. For instance, change the diamond-shaped red and yellow “S” (Superman) into the first letter of your child’s name. For a Batman invitation, trace a Batman mask with pointy ears onto black cardstock, then cut out the eyes and mouth and write on the back with a silver marker. Use Superhero stickers to decorate the invitations. Newspaper Invitation: Cut out newspaper clippings, scatter and glue them onto a piece of cardstock. These clippings will serve as the background for your own homemade newspaper headline and “article”. Fold the cardstock in two. On the front side, write an ominous headline that warns of evil villains that are planning to take over the world. Inside, write an article that asks all invitees to come to the party dressed as their favorite Superhero and help the birthday kid save the day and capture all the escaped villains. You can write something like: “The Riddler (or Lex Luther, Green Goblin, etc.) has escaped, and Batman/Superman/Spiderman and (child’s name) need YOUR help!! Come celebrate keeping the planet safe! !” Add the date, time, address (Gotham City, etc. ), RSVP, and whatever other info that’s needed. Comic Strip Invitation: Another great idea for Superhero kid birthday parties is to find your Superhero’s comic strip (online or from a comic book), make a copy or scan, white out the speech bubbles, and fill in the party details in a fun action-filled strip. You can come up with lots of fun and creative ideas for decorations for Superhero kid birthday parties. For instance, cut out comic book pages, print images from the Internet and hang all sorts of Superhero posters. Hang all kinds of action signs such as “POW”, “BAM”, “KABLAM”, and lightning bolts around the party area. You can also make signs saying “No villains allowed”, “No passage for Green Goblins”, etc. Gather your kid’s Superhero figures, toys, etc. and scatter them around the party area. Use them also as table centerpieces. Additional decorations for Spiderman kid birthday parties can include blue and red balloons and streamers, all sorts of spider decorations you have boxed up from last Halloween. Another cool scene setter idea for Spiderman kid birthday parties is to disperse these great cobwebs all around the party area, doorframes, chair backs and put nets on tables over the table cloth. Decorations for Batman kid birthday parties should be in black and yellow. Make cutouts of Bats and attach to balloons, streamers, walls and the ceiling. Make sure you take a look at these homemade Superhero costumes submitted by our visitors with photos and detailed writeups! Ask the guests to bring what costumes they’ve got, and you can also make capes to hand out. Make them from the appropriate fabric color, iron the edges with seam tape and then pull elastic and ribbons through to tie (elastic keeps it from being a potential choker). You can also use velcro to attach around the neck. You can also provide stick-on felt stars and letters for the kids to decorate their capes during the beginning of your Superhero kid birthday parties. Also, supply kids with masks, gloves, glasses or other fitting accessories. Paint the guests with special Superhero symbols, such as bats, spiders, question marks, lightning bolts, etc. The kids’ll have loads of fun making their own Superhero insignia shirts. Buy a few packages of plain white T-shirts. Beforehand, get a few pieces of cardboard and cut out templates of Superhero emblems such as a lightening bolt in a circle for Flash, a bat signal for Batman, a big W for Wonder Woman, a diamond with an S for Superman, etc. The kids pick the logo they want and paint it onto the front of their shirts. Check out the cool Superhero theme party cake ideas on coolest-birthday-cakes.com, the Web’s largest gallery of homemade birthday cakes. You’ll find thousands of cakes submitted by visitors like yourself with photos and how-to tips. During food time, a great idea for Superhero kid birthday parties is to set up an extra place without anyone really noticing it. Then, have an adult dressed up as a Superhero bash in through the door and sit to eat with the kids (the look on their faces when he comes in should be remembered!!). 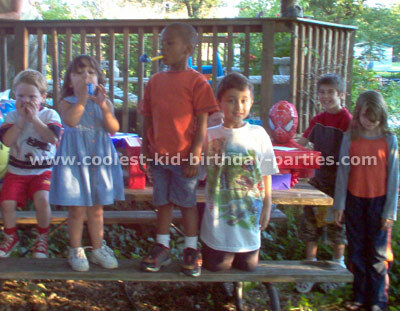 The Superhero can deliver a special birthday present to the birthday kid and token gifts to the rest of the kids. You can have the kids interview him and take a picture of each kid with the Superhero to later add to the thank you cards. Superhero Sandwich: Cut two long loaves of sourdough bread length-wise and fill with layers of meat, cheese, tomato, and lettuce. Emblem Sandwiches and Burgers: Use specialty cookie cutters, such as a diamond, bat, lightning bold, etc. *Super Power Sticks: Write a sign on a dish that says “For Super X-Ray Vision” and put inside sliced Carrots. “For Super Strength” use celery. And so on. Suddenly the veggies aren’t what they used to be. Peter Parker’s Pizza: Add a warning saying that genetic modification will follow! Radioactive Spiders: Oval-shaped sandwiches with vegetable stick legs and olive eyes. Power Drink: Serve the well-known power drink – Gatorade. And super charge it with pop rocks that’ll crackle, pop and split right before the kids’ amazed eyes. Transforming Drink: Superheroes are always transforming back and forth. Here’s a drink that’ll transform right before the kids’ eyes. Prepare colored ice cubes beforehand with colored fruit juice, concentrate, or by adding a few drops of food coloring to each compartment before placing the tray in the freezer. Then, when you put the colored ice cubes in a clear drink like Sprite, it suddenly transforms into that color. Catwoman Claws: Buggles work very well because then the kids can put their fingers in them like claws. Penguin Party Chip and Dip: Use a black plastic top hat and turn it upside down. Then put the chips in it and place a pair of white gloves and a bubblegum cigar by the dip.